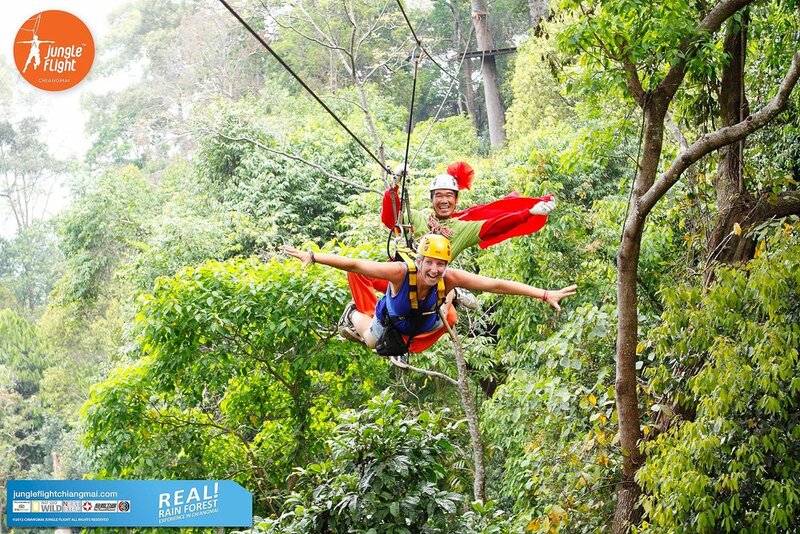 Jungle Flight in Chiang Mai has Thailand’s longest zip-line of 1000 meters! Situated in lush, mountain rainforest just an hour drive from Chiang Mai, Jungle Flight’s eco-adventure is a truly unforgettable experience. Discover breathtaking views and adrenaline pumping excitement, as you are flying through the treetops. Come and try the world’s longest jungle zip-line rollercoaster set deep in the heart of the beautiful Thai rainforest! Experience the canopy as you twist, swoop and spiral in an exhilarating ride. Suspended from the trees, our ingenious system of cables allows the trees to grow naturally while upholding the highest standards of safety, with highly trained guides and world class equipment. On our exciting rollercoaster you will cover 1,100 meters in 4 minutes, whirling through slalom turns, drops and a 360 turn, zig sagging through the trees at thrilling speeds. Join us for a unique ride through the trees! This is the JF3 program and includes all the most exciting attractions. Contact us if you are interested in the shorter JF1 or JF2 programs, we can also arrange them. Our zip-line adventures are perfect for people of all ages. Jungle Flight’s highly trained staff has led guests from 4 years to 80 years old, but for safety reasons there is a maximum weight limit of 120kg.